A steam train has taken passengers from Swanage in Dorset to London for the first time in more than 40 years. The last time a steam-hauled passenger train began its journey in the seaside town and ran along the Swanage Railway through Corfe Castle was in 1966. The 11-coach Capital Christmas Express departed Swanage at 0800 GMT for its five-hour journey to the capital. The line was recently restored and in May the first steam train returned and did the trip in the opposite direction. The last time that a steam train bound for London started its journey at Swanage's Victorian terminal station was on 4 September 1966. 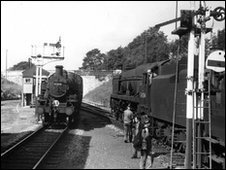 On 5 September 1966, British Rail replaced the steam engines, which had run since May 1885, when the Purbeck branch line opened, with diesel-powered ones. British Rail shut the line from Wareham to Swanage in 1972 and took away seven miles of track. Since then campaigners from the Swanage Railway Trust have fought for the line to be rebuilt and watched it grow mile by mile over the years. 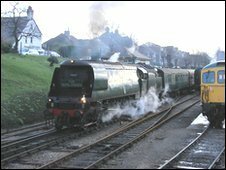 A 1940s-built Southern Railway Bulleid Pacific steam locomotive, named Tangmere after the West Sussex Battle of Britain airfield, was used to pull Saturday's train. After arriving at London's Waterloo station, the train began its return to Swanage at 1715 GMT. Steve Doughty, Swanage Railway Trust chairman, said: "I'm absolutely delighted that the day has now arrived when the residents of Swanage and the Isle of Purbeck can once again travel to London and back by train for the first time in 43 years. "Everyone on the Swanage Railway is very grateful to Network Rail and train operator West Coast Railways for its help in running this train over the three miles of line between Furzebrook and the main line at Wareham which is currently closed to regular passenger trains." History was also made on 1 April when the first passenger through train since 1972, called the Purbeck Pioneer, went from London to Swanage. On 2 May, the first steam train took passengers from London to Swanage. Trains have been running on parts of the preserved line for some years but these are the first complete through services.